Adam McCormick had just turned fifteen when the body was found in the woods. It is the beginning of an autumn that will change his life forever. Jamie Marks was a boy a lot like Adam, a boy no one paid much attention to, a boy almost no one would truly miss. And for the first time, Adam feels he has a purpose. Now, more than ever, Jamie needs a friend. But the longer Adam holds onto Jamie’s ghost, the longer he keeps his friend tethered to a world where he no longer belongs…and the weaker Adam’s own ties to the living become. Now, to find his way back, Adam must learn for himself what it truly means to be alive. 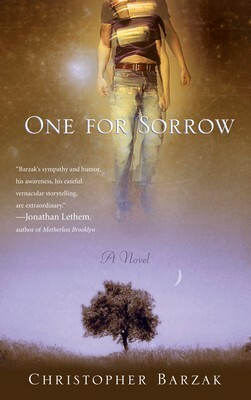 Part thriller, part ghost tale, part love story, One for Sorrow is a novel as timeless as Catcher in the Rye and as hauntingly lyrical as The Lovely Bones. Christopher Barzak’s stunning debut tells of a teenaged boy’s coming-of-age that begins with a shocking murder and ends with a reason to hope.